The word “shojin” in the Buddhist religion means to go to great lengths to do one’s best without the expectation of outcomes. In the Shinto religion, it means to abstain from external impurities and seclude oneself in a designated place. Dewa Sanzan Shojin Ryori was created from a blend of Shojin Ryori developed at temples, the diet of the Shugendo yamabushi (mountain ascetic priests) who practiced sustainable living, and the culture of Kyoto brought by kitamaebune boats. It is also characterized by an abundance of mountain vegetables and mushrooms that grow in the Japanese beech tree forests of Mt. Gassan. The gathering, seasoning, preservation, and preparation of those mountain riches reflect the wisdom of the forefathers. 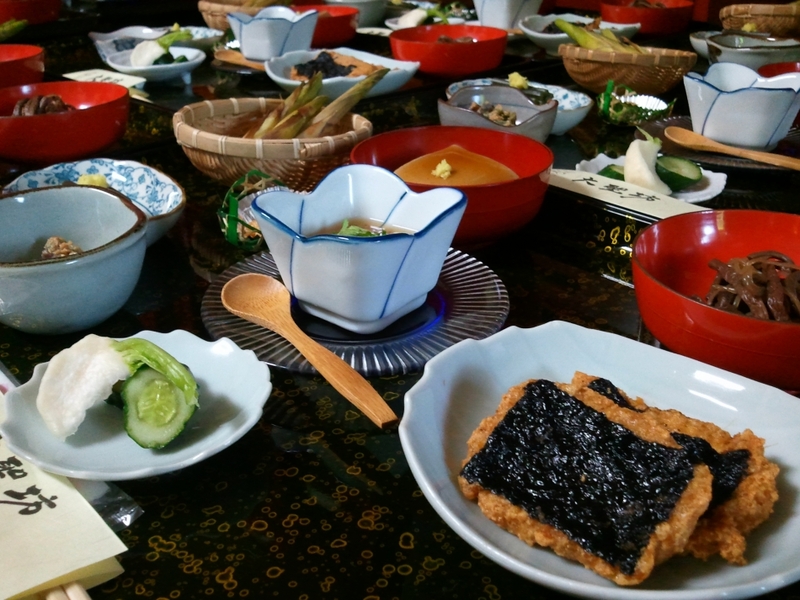 The act of eating in Haguro Shugendo not only signifies feeding the body and mind, but also the gift of life that is found in the deities and spirits residing in nature. Each culinary dish is named after a place related to the Dewa Sanzan religion (derived from the esoteric terminology of the Shugen worshippers). Those wishing to understand Dewa Sanzan should learn about the cuisine that represents the faith and sacred land, and try each dish. Consuming Dewa Sanzan Shojin Ryori means tasting the “source of life” given to us by the sacred mountains. Shorei Festival is held each year on Mt. Haguro from New Year’s Eve until New Year’s Day. In this festival, two virtuous yamabushi priests called “matsunohijiri” undergo ascetic practices for a period of 100 days to pray for peace, national tranquility, bountiful harvests, and happiness for all. The last day of that training period is New Year’s Eve when the Shorei Festival is held. Being chosen as a matsunohijiri is the greatest honor for a Haguro yamabushi priest. The 100 days of ascetic training and the Shorei Festival are referred to as Fuyu-no-Mine. A ritual called Ooizake was held during Fuyu-no-Mine until about 1921. It is said that in this ritual, the matsunohijiri invited leaders from Mt. Haguro who carried out the festival and served them with such a wonderful presentation of Shojin Ryori that it was called the greatest feast in Japan. There were 123 different ingredients used in the cuisine for 25 dishes. Apparently, procurement of the ingredients began several years in advance, and cost so much that some families went broke. Today, that Shojin Ryori is only a dream. Through a Japan Foundation project conducted in 2012, Dewa Sanzan Shojin Ryori was presented in Paris, France and Budapest, Hungary. Participants were interested not only in the Shojin Ryori, but also in the over 1,400 year-old tradition and culture of Dewa Sanzan that forms the backdrop to the cuisine. The popularity of Japanese cuisine contributed to rave reviews. Mikkazuki-zen and Suzukaze-zen can be enjoyed at Saikan by reservation. There are 30 shukubo (pilgrim’s lodgings) in the Toge District of Haguro. 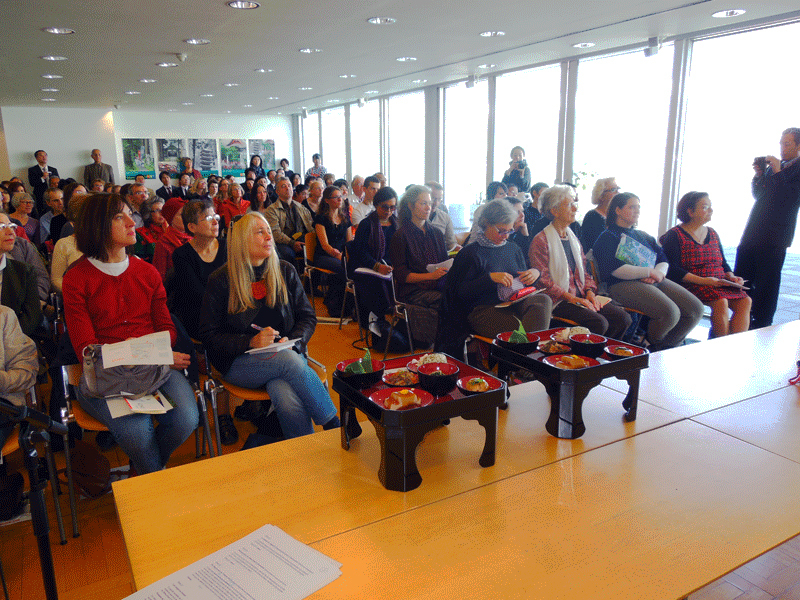 The owners, the proprietresses, and the proprietresses-to-be started the Dewa Sanzan Shojin Ryori Project in June 2012. Opportunities were created for the women to gather, changing the old-fashioned custom of “staying out of other people’s kitchens.” They hold study sessions to learn about each other’s dishes, share knowledge, and hold events within and without the prefecture to share Dewa Sanzan Shojin Ryori with many others. A forgotten dish called “minato-age” was revived by proprietresses with many years of experience.